The below youtube playlist will be enough for the certificate. I am using it and all my other friends who already passed the exam liked it and said that it is enough to clear the CCA175..
Its good that the "Required Skills" section is pretty specific but there is some contradiction. "In some cases, a tool such as Impala or Hive may be used. " but "required skills" section make no mention of impala. Similarly, "required skills" section dont mentio pig at all. Does it mean pig will not be asked in the exam? however, pig is included in the list of resources available on exam cluster. and you can see the list do not include pig or impala. The CCA-175 exam is a hands-on, scenario-driven test. You will be asked to solve problems. The grading will be based on the solutions that you provide. We do not evaluate the tools or the code that you used to solve the problems. Can you use Pig? Absolutely. It may be possible to solve every one of the problems on the exam using just Pig if you are an expert. It may not be practical, however. There may be better tools for interacting with the Hive metastore to do DDL, such as Impala, Hive, HUE, HCatalog, etc. Similarly, the coding questions will give you Spark templates to add code to. You may not have enough time in the exam to code everything from scratch in Pig. Pig is not listed in the Required Skills, because there will not be a specific question where you are required to use Pig on the exam. There is no contradiction. This is a "problem solving exam" as opposed to a "tools exam". You will need to be able to use Hadoop tools to generate solutions, but the tool that you use is up to you. when we answer a question in exam and compile(submit) it, does it tell you whether it was correct or not (I mean for individual questions not for entire exam)?? As for spark test part, can I choose either Python or Scala for exam? Or does I have to learn both Python and Scala to pass the exam? uma, did u get reply. I took the Developer Training for Spark and Hadoop last month. And I am planning for CCA175. But when I look at the skillset here -http://www.cloudera.com/training/certification/cca-spark.html , I see the Data Analysis part was not covered in the course, and instead Kafka and Flume has been covered in the course. Can you please confirm if the CCA175 will include the updated content (wihth Kafka, Flume) or it still will include the Hive, Impala? And how long will the CCA175 include Data Analysis part? PLease advice as I am planning for certification soon. 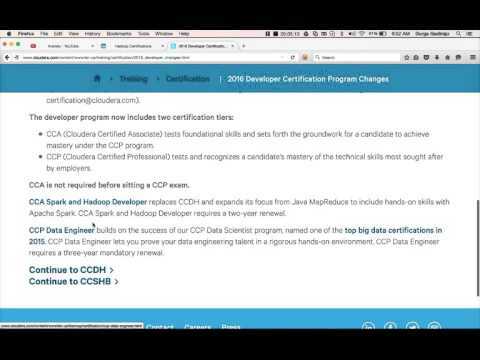 I am planning to give my cloudera CCA 175 exam soon. I found that there is very little mentioned about Hive (topics like paritioned/bucket tables) or Avro (topics like Schema evolution etc) in the objectives on this site https://www.cloudera.com/more/training/certification/cca-spark.html. Does this mean there will be no question on the advance topics in Hive or Avro in the exam ? I looked over the CCA175 page and while there is little mention of Hive or Avro one particular section stands out. Perhaps you are looking at the exam as individual questions rather than tasks to complete. I would look over the required skills portion of that page and think about how you would accomplish each task. If Hive and Avro would be involved in your process to comlete a task, then prepare accordingly.